The Indian Air Force (IAF) on Friday contradicted a report by US publication Foreign Policy that implied India had falsely claimed to have shot down a Pakistan Air Force (PAF) F-16 when fighter aircraft from the two sides clashed on February 27 over Jammu and Kashmir. Foreign Policy cites senior American defence officials as stating that US personnel had “recently counted Islamabad’s F-16s and found none missing”. “The Indian forces have confirmed sighting ejections at two different places on that day. One was an IAF MiG-21 Bison and the other a PAF aircraft. Electronic signatures gathered by us indicate that the PAF aircraft was an F-16,” said the IAF. Senior IAF sources presented a detailed circumstantial case, built around intercepts of Pakistani radio transmissions, radar signatures detected by IAF airborne warning and control system (AWACS) aircraft that were controlling the battle, visual confirmation of a pilot bailing out from a second stricken aircraft, other than the MiG-21. The sources argue that this could only have been a Pakistani F-16, since the PAF’s other fighters — JF-17 Thunder and Mirage III/V — were elsewhere in the battlespace. The sources presented transcripts of radio conversations between Pakistani ground troops on February 27, which talked about a second captured pilot, who was mistakenly identified as an IAF pilot and then taken to a Pakistani hospital. IAF sources point out this was corroborated by the confusion within the Pakistan military’s public relations organisation, Inter-Services Public Relations (ISPR), whose director, Major General Asif Ghafoor, posted on Twitter at 11:49 am: “One Indian pilot arrested by troops on the ground and two in the area”. In a press conference, which was posted on Twitter at 1:14 pm, Ghafoor stated that Pakistani ground troops had captured two Indian pilots. One of them, he stated, was injured and under treatment in the CMH. 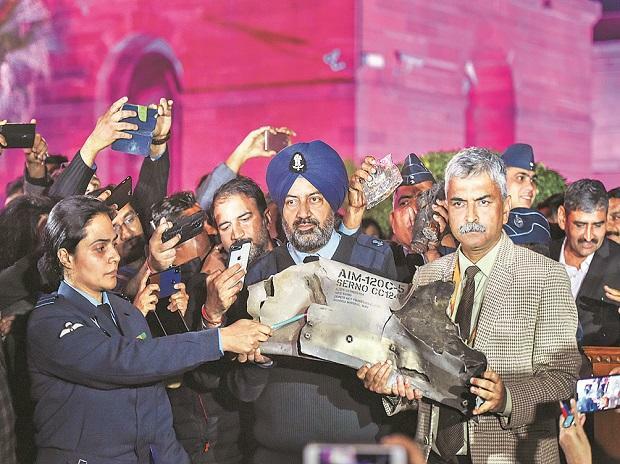 In the same press conference, Ghafoor denied any F-16 had been shot down and stated that “No F-16s had taken part in this engagement.” Several days later, after the IAF displayed the wreckage of an AMRAAM air-to-air missile, which arms the F-16 fighter, Pakistani spokesperson changed tack, admitting that F-16s had taken part. IAF sources also presented a playout of the AWACS radar display, which showed a MiG-21 icon heading towards an F-16 icon, which subsequently vanished from the display. The IAF says that proves the F-16 was shot down, but there is no way of verifying this. The sources also presented a photo, posted at that time on social media, which showed Pakistani ground troops gathered around the mangled engine of a crashed aircraft. They pointed out that the longitudinal corrugations on that engine are different from the lateral corrugations on a MiG-21 engine. Finally, the sources cited radio intercepts that indicated that one Pakistani F-16 fighter stopped transmitting abruptly, suggesting it had crashed. Both the PAF and the IAF have presented divergent narratives of the aerial combat on February 27, a day after the IAF struck terrorist camps deep inside Pakistan to retaliate against the Valentine’s Day terrorist bombing of a security forces convoy in Kashmir in which over 40 paramilitary soldiers were killed.